In order to make our server more energetic at the moment provides better in games experience, we are going to merge the servers below on 14th December 2017. The data below will remain the same after server merge. Character level, heroes, mount, equipment, artifact and other attribute system. ii. Players’ relationship ingame : Friend List, Guildmate and couple. iii. Instance’s entry chances: daily instance entry, boss challenge chance, hero expedition “Reseat” chance, brave tower entry and so on. vi. Others which did not mentioned below will remain unchange. > The ranking record below will not be cleared but will rearrange accordingly after server merge. > The ranking below will be cleared. Players need to online or participate at least once to be appear in ranking after server merge. Note : arena ranking will reset, players need to fight again beyond 2000th ranking. iv. The powerful king. Every guard reset to Lv 1. Players who occupied the title also reset. Any characters which did not login for long time will be deleted. If all character under same account fulfill the condition to be deleted, then that account will be removed. i. After character deleting, if the player account still exist more than 4 characters, the character list will be scrollable. ii. The player who has more than 4 characters unable to create new character. After server merging, if both characters having same name, system will rename the character which satisfied the condition to “Character name + serial number 1”. If multiple server involved, serial number will be 1, 2, 3 and so on. Those characters being renamed by our system will receive one piece of “Player Rename Card”. i. Character with lower level will be renamed while high level character remain unchange. ii. In case of same level, the one with lower VIP level will be renamed while another remain. iii. In case of character level and VIP level are equivalent, the character which has lower combat power will be renamed. After server merging, if there exist duplicate guild name, system will rename the guild which satisfied the condition to “Guild name + serial number 1”. If multiple server involved, serial number will be 1, 2, 3 and so on. The guild being renamed by our system will enjoy one time free renaming service at guild interface. i. Guild with lower level will be renamed while another remain unchange. ii. In case of same level, the guild with lesser contribution point will be renamed. The data of Hall of Fame will be cleared after the server merge. Fights for honour and leave your name in our Hall of Fame to be known by others. 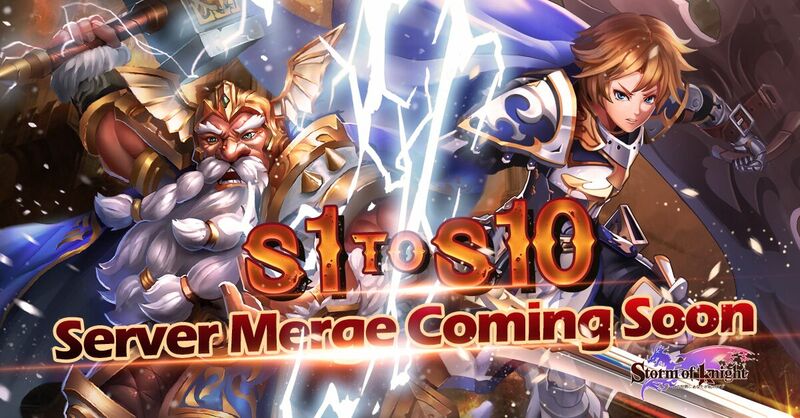 After the server merge, you will be able to meet more friends, more powerful rivals are waiting you to challenge them , it will be a whole new Storm of Knight.